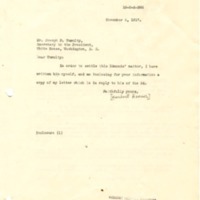 Herbert Hoover tells Tumulty that he has written to Edmonds in order to resolve the matter in his letter. In order to settle this Edmonds’ matter, I have written him myself, and am inclosing for your information a copy of my letter which is in reply to his of the 3d. Hoover, Herbert, 1874-1964, “Herbert Hoover to Joseph P. Tumulty,” 1917 November 6, WWP19247, Hoover Institute at Stanford University Collection, Woodrow Wilson Presidential Library & Museum, Staunton, Virginia.